This restored carriage lane is part of the 14-mile Hyde Park Trail connecting historic sites and local parks. 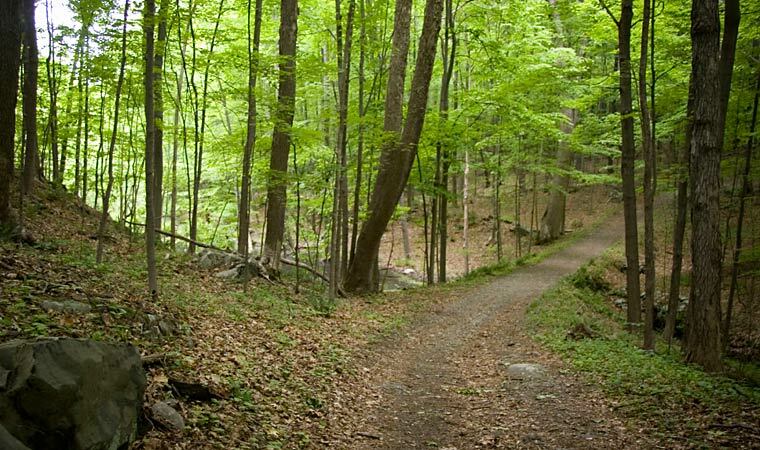 HYDE PARK, Dutchess County (334 acres)—Scenic Hudson originally protected the land surrounding this 1.8-mile road connecting the Home of Franklin D. Roosevelt and Eleanor Roosevelt National Historic Sites—once the location of FDR's tree plantation. The Farm Lane Trail, now owned by National Park Services, is part of the 14-mile Hyde Park Trail connecting historic sites and local parks that often traverses old carriage paths. For inquiries about the Roosevelt Farm Lane Trail, contact the Home of Franklin D. Roosevelt National Historic Site at 845-FDR-VISIT. Year round daily, dawn to dusk. Trailhead in Hyde Park is directly across from the Home of Franklin D. Roosevelt National Historic Site.